Are the hot summer days getting to you? Has the boredom with the kids set in? I have the cure mom can set back, tan, and relax in the sun while the kids blast off with Blast Zone's Hydro Rush available on Amazon now. Your kids will be the most popular on the block and will be the envy of every child on the block. Hydro Rush is a blast for birthdays, get to gathers and more. The picture above was taken at my nephew Tristen's birthday. How many times a year do you rent inflatables for the kids? We generally rent 2 times a year but go to the local inflatable play land 10 or more times. For us it was just the logical choice to have our own Blast Zone Hydro Rush! My kids love water and we spend as much or more renting. We may actually save now that we have our own! The Hydro Rush features a spray cannon that continuously squirts water keeping the kids cool. The large slide has an easy climbing system where the kids can pull themselves up and foot holds to climb up as well. My 4 and 5 year old had a blast we had 5 boys together and they were all able to enjoy the Hydro Rush it is very large but takes a minimal amount of water. That was a favorite feature of mine the Hydro Rush will not put a cramp on your water bill . If the Hydro Rush isn't right for you check out all of Blast Zone's other options here http://www.bouncersdirect.com/shop/pc/home.asp. 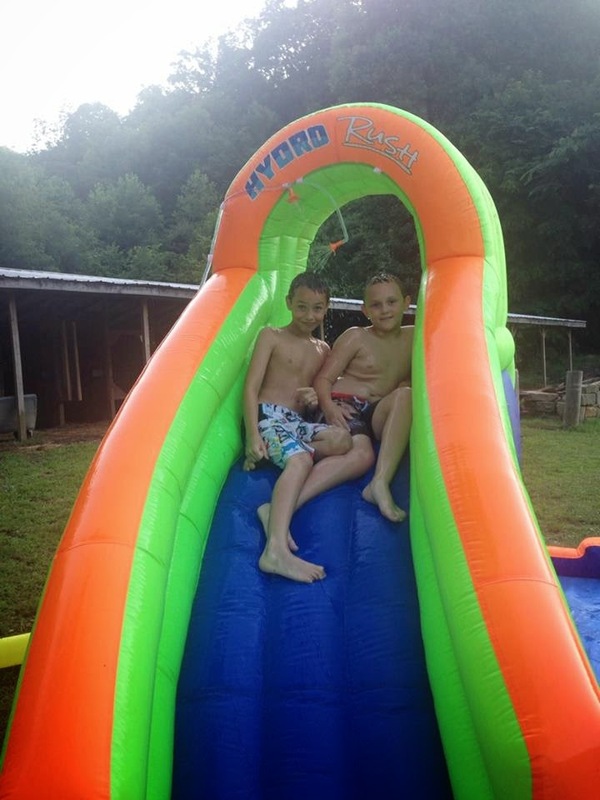 Blast Zone has water parks, bounce houses, inflatable slides, inflatable combos and bouncy castles! I love the Bounce Houses and that's what you guys will have the chance to win! Make sure you follow Blast Zone on facebook https://www.facebook.com/BlastZoneBounce and tell them thank you for the chance to win this amazing prize! Free For All was given a sample to facilitate this review all opinions are 100 percent my own. No financial compensation was received! my kids would have a blast on this!! What an excellent awesome fun thing to have in the back yard! EVERY ONE would LOVE IT! I can see the photo opps now! Nostalgia Sno Cone Maker Giveaway! Plan your next #Birthday with Shindigz Review!